Tuesday May 22nd 1900 I was busy with the work all forenoon. Will churned twice for me. I was down to Adas and up to Nelsons both in the afternoon. I worked the butter after I came home and did the evening work. Wednesday May 23rd 1900 I was busy all forenoon with the dinner and looking after my chickens and turkeys that are hatching and setting more hens. Will and I went up town in the afternoon I did some errands and went over the river a little while. Lee about the same [Legrand] is six years old today and Fanny had a nice party for him. I was there a little while. 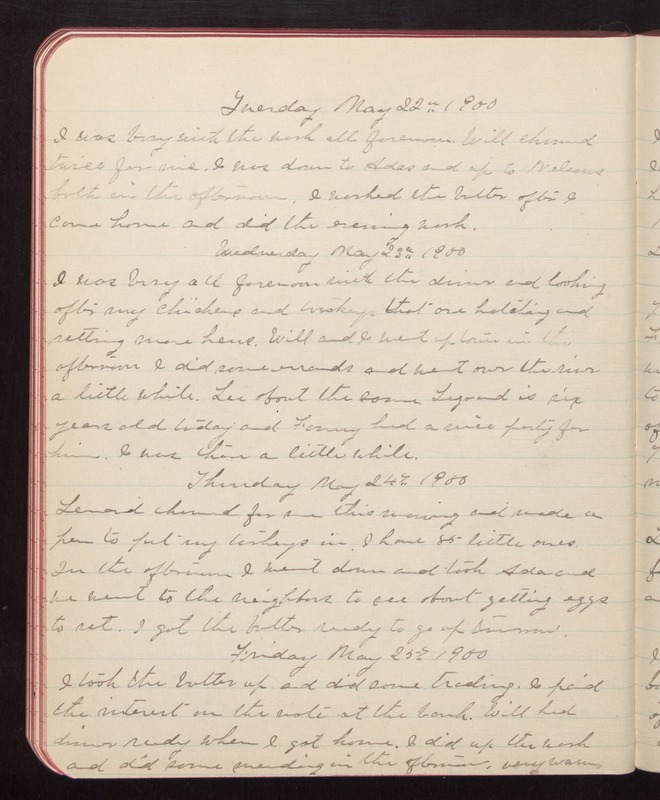 Thursday May 24th 1900 Leonard churned for me this morning and made a pen to put my turkeys in. I have 85 little ones. In the afternoon I went down and took Ada and we went to the neighbors to see about getting eggs to set. I got the butter ready to go up tomorrow. Friday May 25th 1900 I took the butter up and did some trading. I paid the interest on the note at the bank. Will had dinner ready when I got home. I did up the wash and did some mending in the afternoon. Very warm.